Peony tattoos are beautiful and these have become one of the most popular pieces of body art. The flowers symbolize many things including good fortune, romance, compassion and more. So, not only is it a stunning flower, but it has a deeper meaning too. 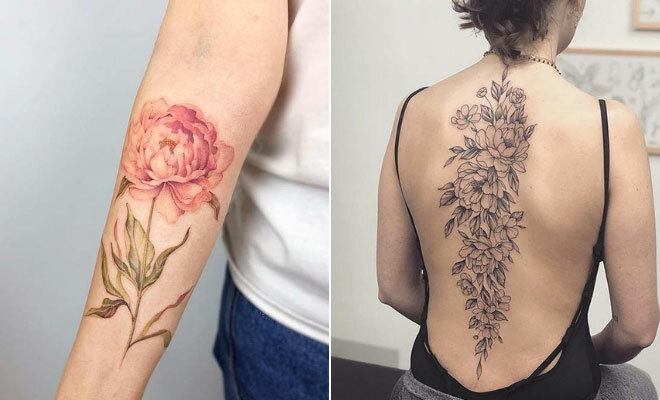 We love peony tattoos and think you will too, so we have put together 23 beautiful tattoo designs. After seeing them, you will want one of these pretty tattoos. On this list, you will find colorful tattoos, bold floral designs and more. You won’t be able to decide which tattoo is your favorite! We would like to begin by showing you this stunning back tattoo. 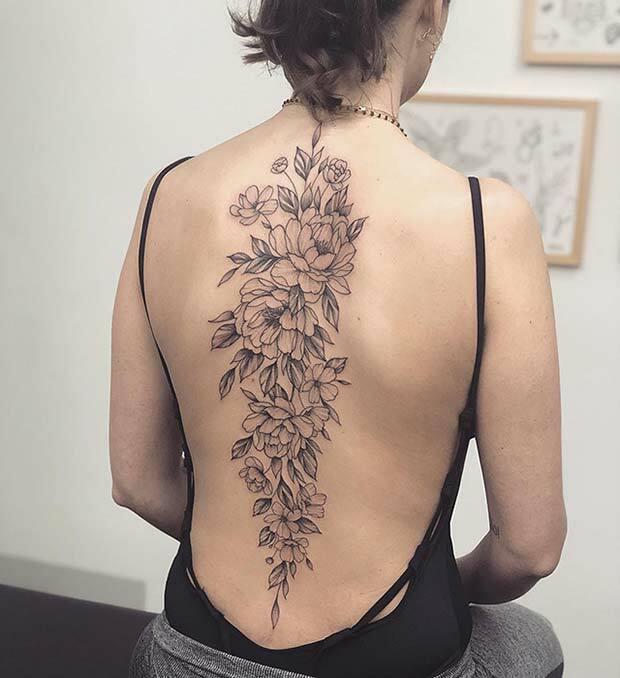 Beautiful peony flowers have been tattooed all the way down the spine. It is such a gorgeous tattoo that will make a statement. 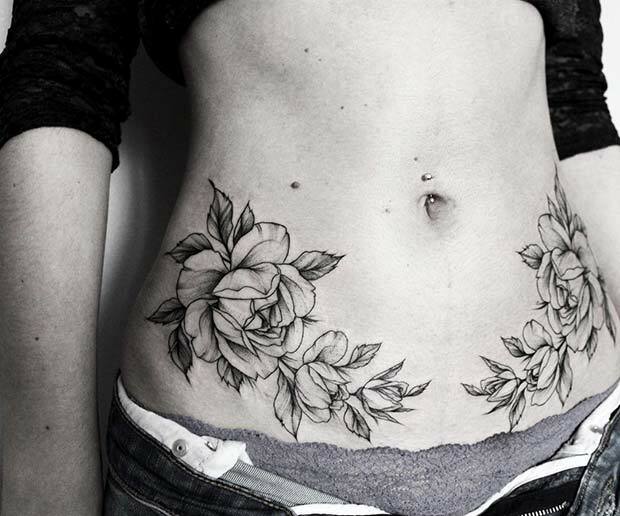 Recreate a black ink floral design like this or add some color. Watercolor would look amazing! This next tattoo just reminds us of summer days. The design features a pretty pink peony with raspberries in the background. It is a beautiful, botanical design and we think the color combination of pink, red and green is gorgeous. A tattoo like this will suit everyone and it is perfect for those who love nature and the outdoors. Peonies can be paired with almost any other tattoo design. 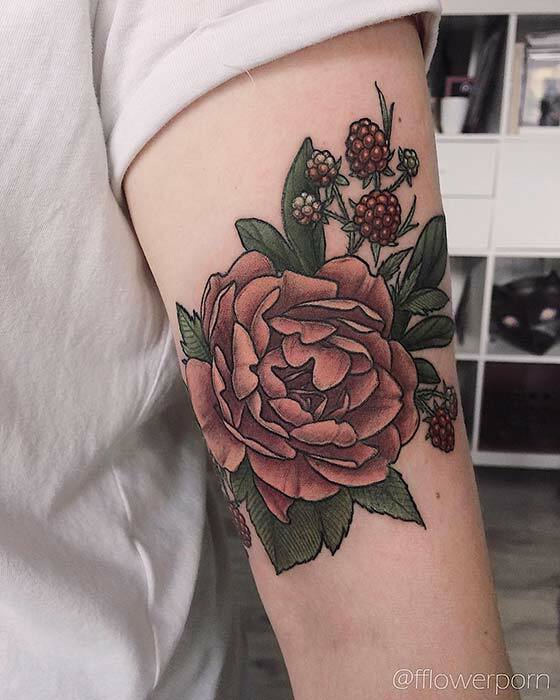 Here we have a cool tattoo with a peony and mandala combination! 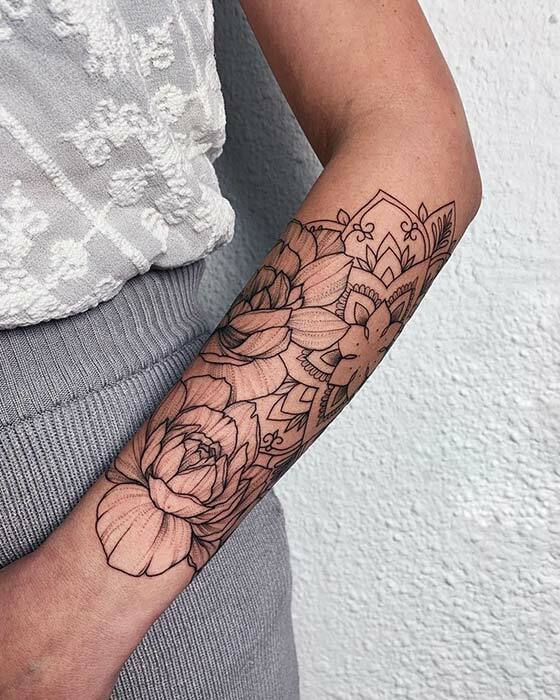 The design is tattooed on the forearm and features peonies with an elegant mandala. It is a stylish idea and it allows you to have two of the must-have designs in one tattoo. Recreate something similar to this or choose your own mandala design. If you are looking for a pretty and chic tattoo, then this is for you. 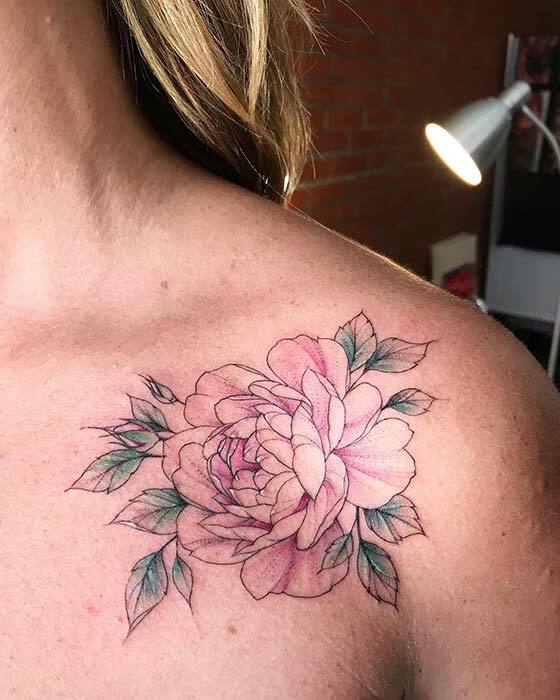 This design features a delicate pink peony that is tattooed on the shoulder. The colors are beautiful and it does have a soft watercolor effect. It is a stunning tattoo and it is perfect for someone who wants a subtler tattoo with a little color. Looking for a bright and bold flower tattoo? Then you need to check out this next idea. 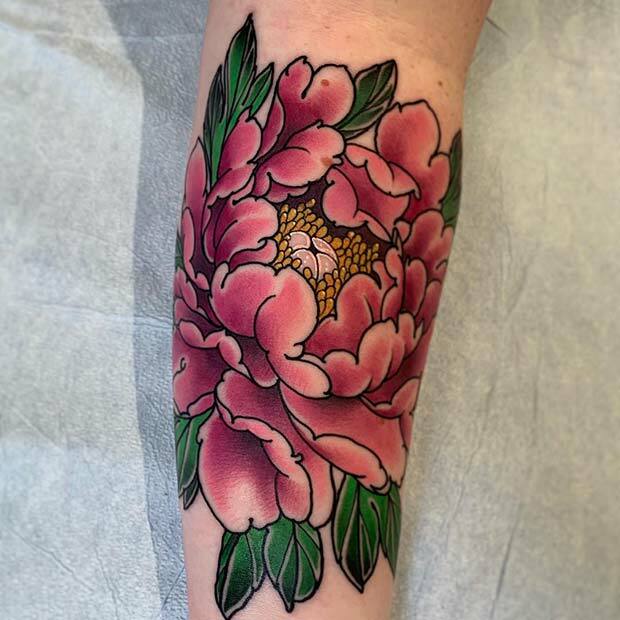 Here we have a pink peony tattoo. We love the colors used here because they are so vivid and vibrant! It is a stunning design that is perfect for someone who wants a statement making tattoo. A design like this can be placed anywhere on the body. It would look super stylish on the arm or leg. Next, we have a trendy ankle design. 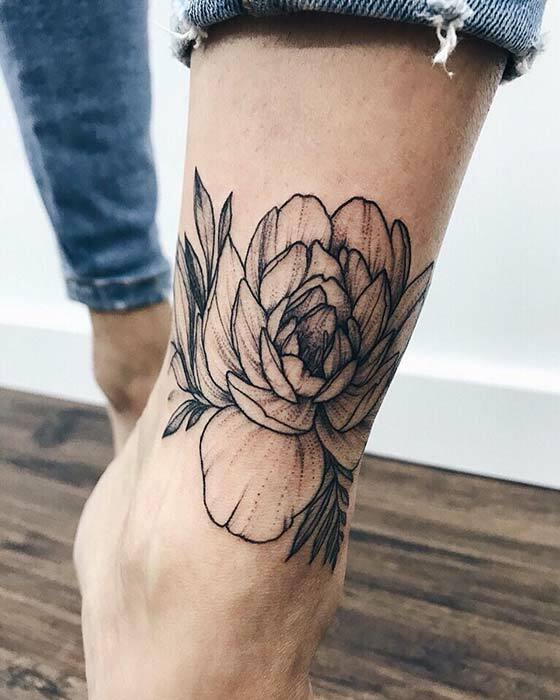 This tattoo features a black ink peony that is tattooed on the ankle. It is a stunning and stylish idea that creates an anklet look. Try a similar tattoo to this or you can have smaller peony flowers. You can also add color to for a bolder tattoo design. Our next idea is bold and botanical. 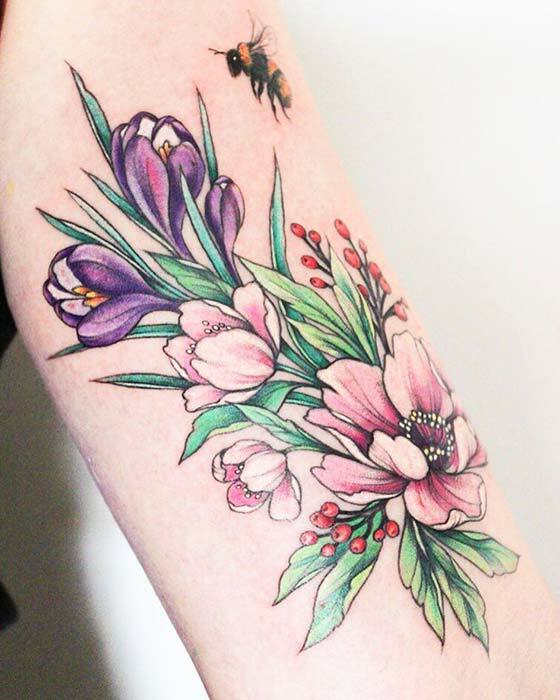 Here we have a bright and colorful tattoo that features purple flowers, beautiful pink peonies, berries and a bee too. It is a stunning, unique and vibrant tattoo. You can recreate a tattoo like this or try different flowers with the peonies. Peonies are delicate and pretty flowers, however this next design gives the flowers an edgy and trendy vibe. Here we have two matching peony tattoos that have been placed on the hips. It is such a stylish idea and it is perfect for the ladies who want a bold tattoo. Recreate the black ink design or you can add color. Watercolor tattoos are another beautiful idea that you can try. This tattoo shows how to wear a watercolor design in style. 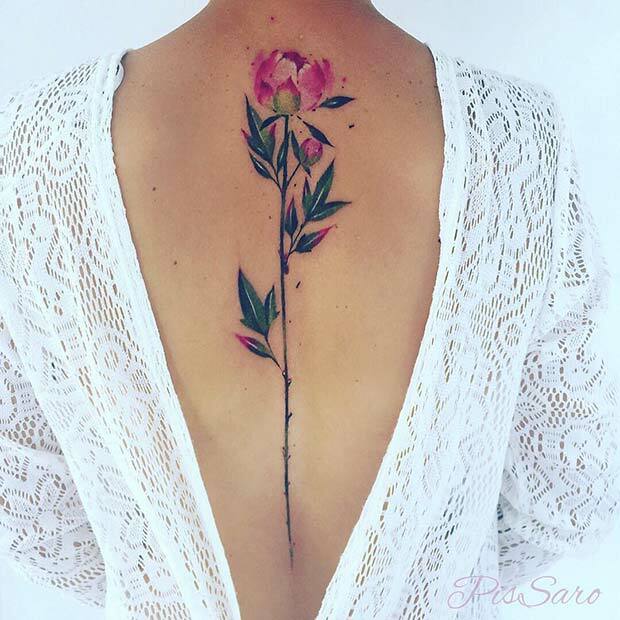 The tattoo features a peony with stem that goes all the way down the spine. It is colored in with the watercolor technique too. The colors give the design a look of elegance. It is a stunning tattoo that will look amazing on anyone. The next tattoo we have to show you is unique and trendy. 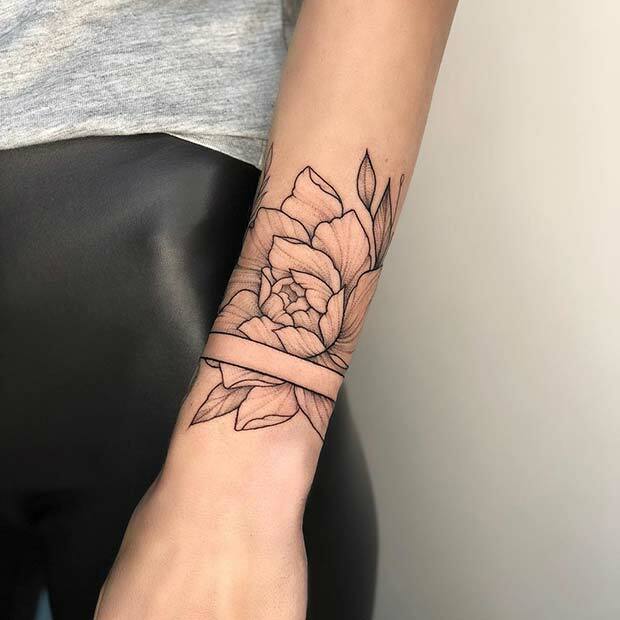 This design features a gorgeous peony that is tattooed on the wrist. The tattoo also has a trendy cut-out design to where the skin is left without any tattooing. It is a such a cool idea and is perfect for someone who wants a bold and unusual tattoo.